Looking for a vacation offering both modern and ancient environments to explore? Just over on the Northeastern side of Mexico’s Yucatán Peninsula there lies a long stretch of Caribbean coastline called the Riviera Maya. This beautiful destination offers the conveniences of a modern excursion with countless resorts, spas, sports activities, aquatic activities and more, as well as the historically rich remnants of an old Mayan civilization just to the South. Allow Tourico Vacations to whisk you away to a time where present-day amenities didn’t exist and where things like astronomy and agriculture are merely progressive concepts. See the exquisite Mayan architecture wrap itself around the terrain like its own living, breathing entity. Ride horses along the beach or swim in one of the many cenotes for a bit of rustic fun. Or perhaps you would rather stick to the 21st century and get your hands on some state-of-the-art jet skis, zip lines, or sail boats? Either way, Riviera Maya offers a barrage of activities and experiences that can quench the thirst for adventure in any explorer. With temperatures staying around the high seventies all year round, you never have to struggle with it being too cold for the water, or too hot to investigate the coast on a guided jungle tour. Explore the second largest reef system in the world the Belize Barrier Reef. Beginning near Cancun and moving down the entire length of the Riviera Maya, the Belize Barrier Reef continues southward toward Guatemala and is second only to the Great Barrier Reef. Rent some scuba or snorkeling gear and dive into a universe thriving under the crystal blue waters, see schools of colorful fish weaving around miles of corral, or swim with a few friendly dolphins for an experience you’ll never forget. After all the fun is done, you can lay back and relax on one of the numerous perfectly white sandy beaches and enjoy the sunset with a dink of your choice in hand. Hungry? With Riviera Maya being a major tourist destination there are ample opportunities to take advantage of both fresh, local cuisine as well as fine dining options all along the coast. Having a 5-star vacation doesn’t necessarily mean spending 5-star prices. Let Tourico Vacations help you book all the travel and lodging you need for your next Mexican getaway today. 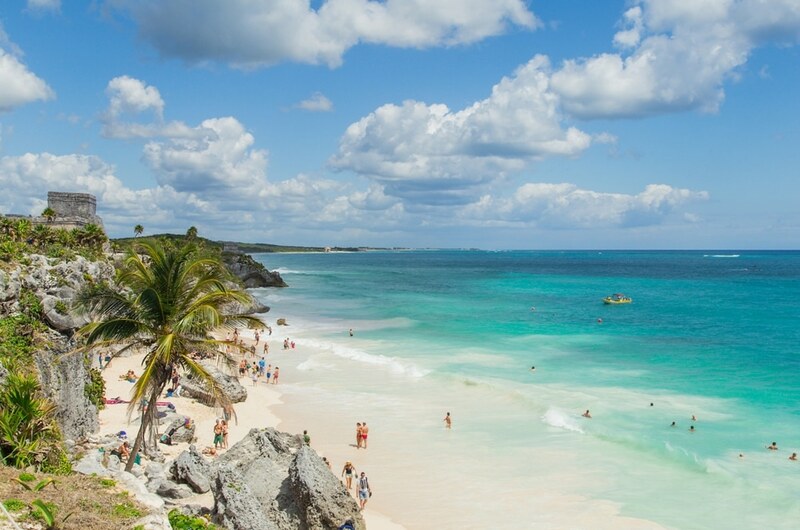 The perfect vacation is waiting for you just below the border.